Good news, boat lovers: there’s a new way to explore the world by ship. Riverboats have solidified their position in the global cruise industry by offering as many amenities and destinations as the standard ocean liner. In 1992, the opening of the Main-Danube Canal connected over 2,200 miles of Europe’s waterways and the river cruising industry was born. Over the last two decades, its made its way to the global stage as one of the hottest new travel trends of 2017 (Travel + Leisure). So why all the buzz? We mapped out exactly what sets this trend apart from its oceanic competitor. Riverboats have strict size requirements to fit beneath bridges and canal locks. That means that unlike ocean cruises, which hold thousands of passengers, you can expect 200 people or less on a river cruise. That’s fewer strangers in your personal space and more boat for you and your squad to enjoy. The compact restrictions have also bred innovative designs, like panoramic sliding windows that offer unique balcony views. Some cruises take sightseeing to the next level with themed cruises. For music lovers, there are tours that follow the footsteps of Mozart, Beethoven, and other classic composers. During the holidays, you can follow routes along cities famous for their Christmas markets like Regensburg in Germany and Linz, Austria. Depending on your route, you can hit several cities in one trip. 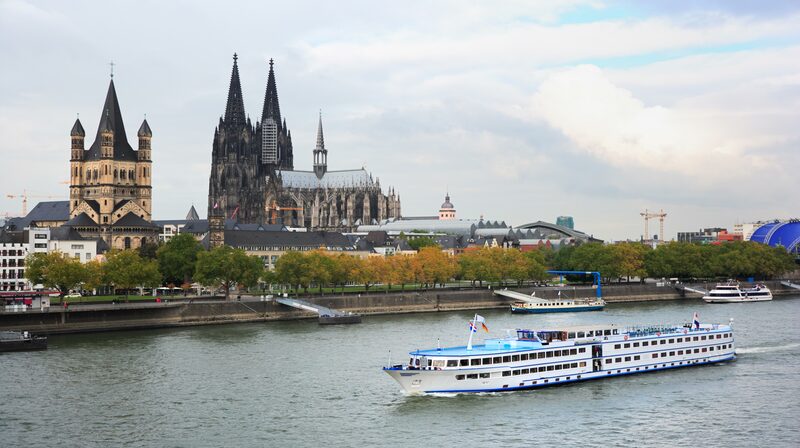 In Europe – the Caribbean of river cruising – most tours travel on the Rhine, which flows through Austria, Germany, France, Liechtenstein, Switzerland, and the Netherlands. Or, opt for the Danube and see Budapest, Bratislava, Vienna, Salzburg, and Linz in just eight days. Say goodbye to the time-wasting “sea days” on ocean cruises. Riverboats dock at a new port every day and the adventures kick off right in the center of town. Most lines also include onshore tours in the cruise fare. From architecture to wine tasting, the opportunities are endless. River cruises may have started in Europe, but there are cruise-worthy rivers all around the world. If you’re a nature lover, you can check out the rain forest along the Amazon River. History buff? Glide down the Nile to catch a glimpse of ancient Egypt.